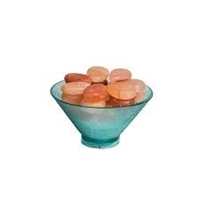 This low-energy, eco-friendly polycarbonate bowl warmer (for use with Saltability's Himalayan Salt Stone Massage) are U.S.-engineered and requires no water or chemicals. The stones are 100% pure pink Himalayan salt, certified organic, antimicrobial and antibacterial. It utilizes LED lighting to heat the stones to their maximum temperature in 40 minutes, and includes a 7 day timer for automatic start-up and shut-off matching spa hours. 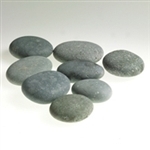 The warmed salt stones emit negative ions in the treatment room benefiting therapists and clients by reducing their oxidative stress. 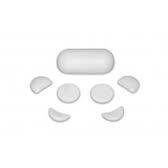 Stones are sprayed and wiped clean with a 100%, all natural, EPA registered, hospital-grade disinfectant. Saltability’s Himalayan Salt Bamboo Warming Tray holds and warms 20 Himalayan salt stones, ready for therapists’ use with Himalayan Salt Stone Massage, and creates a healthier spa environment. The tray warms the salt stones to 108-120 degrees (depending on stone size and thickness) and maintains stones consistent temperature. Salt stones will warm to desired temp in approx 40 min. 13" x 20" natural bamboo tray w/ silicon-covered warming pad. 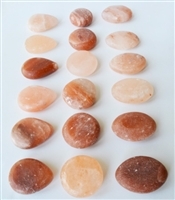 Includes 20 Himalayan Salt Stones (6 round, 6 oval, 6 teardrop and 2 heart stones).The warmed salt stones emit negative ions in the treatment room benefiting therapists and clients by reducing their oxidative stress. Stones are sprayed and wiped clean with a 100%, all natural, EPA registered, hospital-grade disinfectant. Sleekly designed unit can be used alone or placed in any Amber Smart Bar Pod holster. 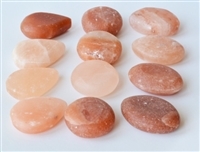 18 Hand-carved Himalayan salt massage stones gently soothe away the accumulation of stress, tension and pollutants. Set includes 6 round, 6 oval and 6 teardrop stones. Size and color will vary. 12 Hand-carved Himalayan salt massage stones gently soothe away the accumulation of stress, tension and pollutants. Set includes 4 round, 4 oval and 4 teardrop stones. Size and color will vary. Each stone set is carefully harvested, giving you consistent quality in each and every stone. 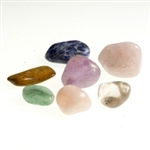 With 13 different shapes and size of stones, including the hard to find specialty stones, you will be able to offer deeper and more therapeutic stone massage. 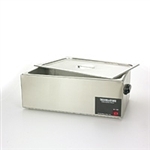 Stainless steel exterior with an easy-clean removable non-stick interior. This 6 quart high quality warmer was designed especially for heating massage stones, and is perfect for heating stones for manicures, pedicures and facials or when needed for smaller spaces. It features a porcelain coated removable water reservoir with an easy-to-clean finish. 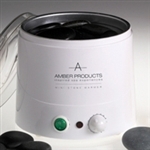 The temperature control features a "preheat" setting of 375 degrees Fahrenheit to heat the water quickly as well as providing an "operating range" of 120-150 degrees Fahrenheit that lets you rapidly bring the stones up to the proper temperature for therapeutic use, and then maintains a constant, even temperature. Includes 15 stones. 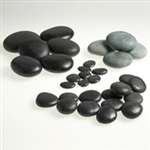 Medium basalt stones range from 2-3 inches. Set of 8. 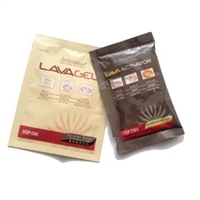 Each Charge consists of a Lava Gel sachet and a Lava Activator that heads the Lava Shell naturally without additional equipment or electricity. 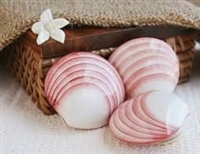 Place the Sachet gel packet inside a Natural or Porcelain Lava Shell, pour in the Activator. An infusion of salt water and essential oil activate in minutes for an hour of soothing heat and relaxation.